Pandora Recovery is a powerful tool for recovering lost or deleted data. It was designed by Pandora Corp and can help to retrieve all kinds of files such as videos, music and over more. Pandora Recovery can proceed to a complete analysis of the hard drives when searching for lost data. It scans thoroughly the computer to its depth to find data accidentally deleted or lost data. It is possible to use this tool to recover almost all kinds of data. It supports music files, videos, documents, pictures and over more. It is also able to retrieve compressed files, encrypted data, archived and hidden items. When the scan process is over, Pandora Recovery allows the user to preview results. He can then identify and select files he wants back. 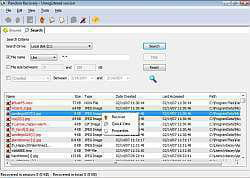 To identify them faster among multiple recoverable items, he can browse them or use the search tool. Pandora Recovery is available in portable version. It does not require any installation. It can be run directly from a USB stick. It is downloadable for free. This program offers an intuitive interface and is easy to handle. Latest update on July 13, 2017 at 06:57 AM.